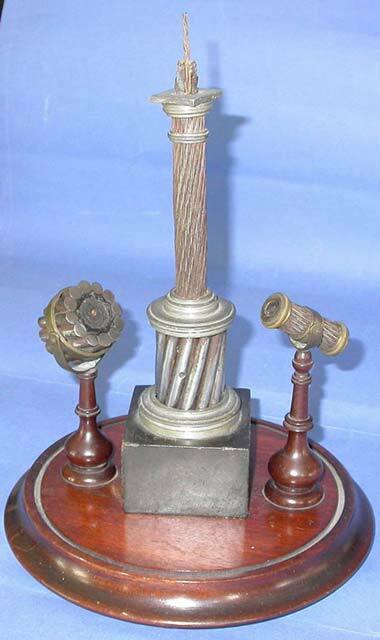 The hallmarks indicate a London maker (un-named), a 1956 manufacturing date, and the material as 0.925 silver. 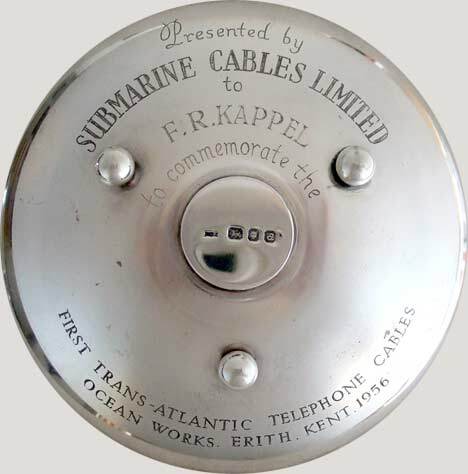 Submarine Cables Limited (SCL) of Erith, Kent, was the manufacturer of the TAT-1 main cable, and Kappel was President of American Telephone and Telegraph (AT&T), one of three sponsors of the cable. The other sponsors were the British Post Office (GPO) and the Canadian Overseas Telecommunications Corporation (COTC). Another identical dish is inscribed to F.C. 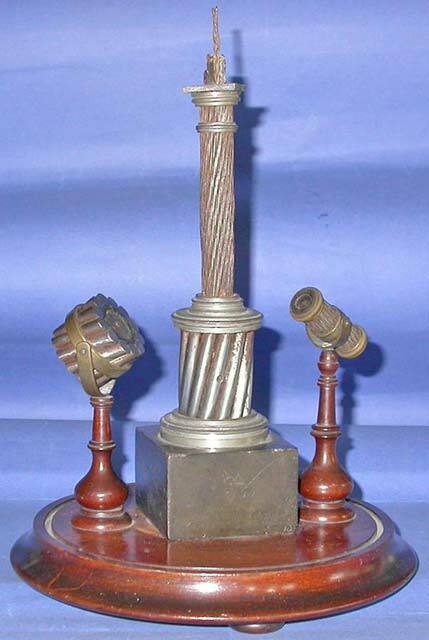 Wright, who was employed by Standard Telephones and Cables at the time and later became managing director and then chairman of the company. STC designed and made the shallow water repeaters used in the 300-mile Cabot Strait cable which connected TAT-1 from Newfoundland to the mainland. A third dish is inscribed to Miss I. Bothwell-Thomson, whose role in the project is not known. In the centre of each dish is a small section of cable; oddly, this is not a piece of TAT-1. TAT-1 was inaugurated on 25 September 1956 with a three-way conversation over the cable between New York, Ottawa, and London. Many distinguished guests participated in this first official call over TAT-1. 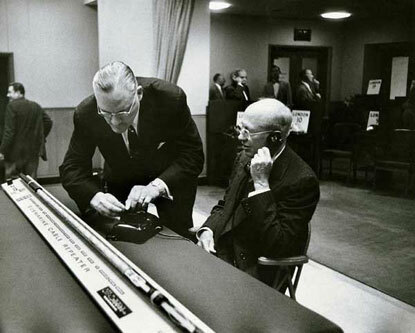 AT&T President Frederick Kappel (left) and AT&T Bell Telephone Laboratories President Oliver Buckley prepare to speak to England at the opening of the first transatlantic telephone cable, Sept. 25, 1956. In New York were Frederick Kappel, President of AT&T; Cleo F. Craig, Chairman of the Board of AT&T; Oliver Buckley, President of AT&T Bell Telephone Laboratories; and George McConnaughey, Chairman of the Federal Communications Commission. In Ottawa were Douglas F. Bowie, President of the Canadian Overseas Telecommunications Corporation; T.W. Edie, President of the Bell Telephone Company; Livingston T. Merchant, U.S. Ambassador to Canada; Mr. Neil Pritchard, the Deputy United Kingdom High Commissioner to Canada; and the honourable George C. Mahler, the Minister of Transport for Canada. In London were Dr. Charles Hill, the Postmaster General; and Sir Gordon Radley, Director General of the Post Office. 250 other guests listened with individual earphones to the first conversation, and the event was recorded by television cameras. In January 1957 the Canadian Broadcasting Corporation (CBC) broadcast a television interview with COTC’s President, Douglas Bowie, who had participated in the TAT-1 opening ceremony just four months earlier. The interview included a demonstration of both telephone and telex calls on the new cable. Video of this interview may be viewed at the CBC archives website. Mr. Bowie noted that one of the 36 telephone circuits could be used to provide 22 telegraph/Telex channels. TAT-1 remained in service until 1978 without a single failure, and was withdrawn from service only because many higher-capacity cables had by then been installed across the Atlantic. 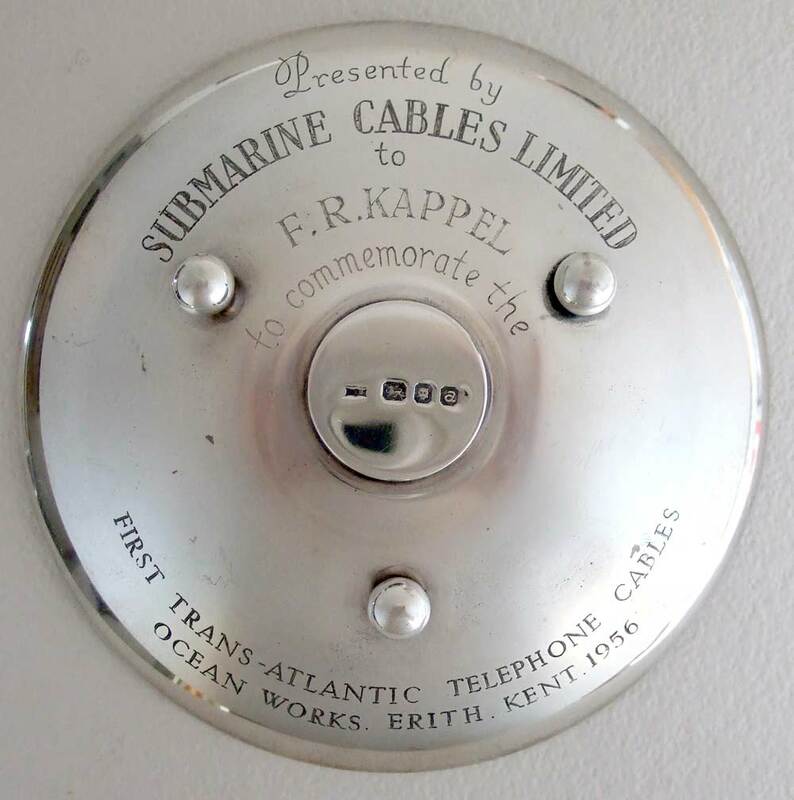 In 2006 the engineering achievement of TAT-1 was commemorated with the installation of a plaque in Clarenville, Newfoundland, the site of the Canadian landing of the cable. The photograph below, from Tom Wills of AT&T, shows the plaque before it was sent to Newfoundland. AT&T, BT and Teleglobe had a bronze plaque made to commemorate the the 50th anniversary of the landing of TAT-1. 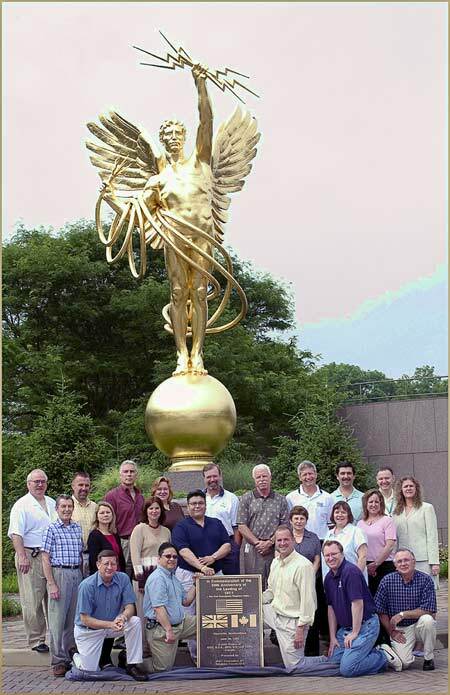 Before we sent it off, we had a team photo taken with the plaque in front of “Golden Boy” at AT&T’s Global Network Operations Center in Bedminster, New Jersey. Thanks to Jerry Hayes for the photograph and the note from Tom Wills. After spending almost a hundred years in Manhattan and New Jersey, in 2009 the “Golden Boy” statue (more formally, “Spirit of Communication”) was moved to AT&T’s new headquarters in Dallas, following the company’s takeover by SBC.